Whether you have a single property to let or a large investment portfolio, SMARTMOVE can offer you a management package tailored to your requirements. As members of the Resident Landlord's Association (RLA) and The Ombudsman of Estate Agents scheme, you can rest assured that we offer a professional service and are committed to maintaining the highest standards. Would you like to know how much your home is worth? 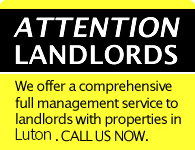 Copyright Smart Move Estates & Lettings Bedfordshire 2014 ©. All Rights Reserved.